I ran the ' Introduction to K9 Fitness- Knowing your dog' seminar on 1st July, with one of my students. Becky Godridge, who is a fully qualified Canine Masseur. This course covered a wide range of topics that are really important to ALL dog owners, not just dog owners that are involved in a working discipline. 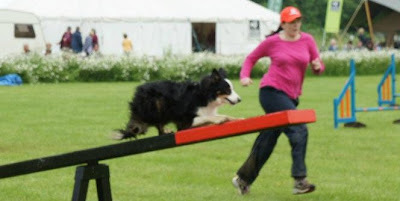 However all the people booked on this course were either Agility, Flyball or had dogs that already had problems.  Gait Analysis & Confirmation – understanding and knowing your dogs limits.  Muscle Building - Core strength and conditioning for performance. 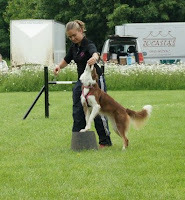 This was the first K9 Fitness course Becky and I have done together. We have received lots a great comments/feedback about the day and have had countless emails asking when the next one is going to be. You will have to keep your eyes peeled as Becky and I are currently discussing future dates and Venues throughout the UK over rest of this and next year. The courses will be advertised on Webpages & Facebook, on various pages (links to the pages are posted at the end of this blog.) If you want to be on the e-mail list to be the 1st for updates of new dates, venues, e-mail me to you name to .. Some pictures from a section of the day and feedback off the students. Talking through and then doing warm up Exercises. (freebie we gave out) Thanks PRO PLAN! Just some of the comments left in the feedback book, from some of people that attended the day. Names were not asked to be left as I didn’t want people to feel pressured into putting a good response. Thanks for a very useful day, very thought provoking and lots of new ideas. Very informative and I learnt a lot, Thank-you. Really informative – Plenty to take away and think about before running my dog. Thank-you. I enjoyed the whole day especially the ‘hands on’ and muscle building in the afternoon. I have so much to think about, lots of good ideas. I need to create a routine warm up and cool down to ensure I do it! Thank you for making me more aware. Very informative day, has taught me many things and how much I can tell off my dogs gait. I need to make myself more familiar with it so that I can try my best to help prevent any problems, aswell as making sure I get used to how my dogs muscles and body feels. The story and info made me defiantly think. Thankyou. Wow I haven’t updated this blog in a while. I’ve been up to so much! I just need more time to get round to training my own dogs! Then, when I finally get time all it does is rain. Typical. 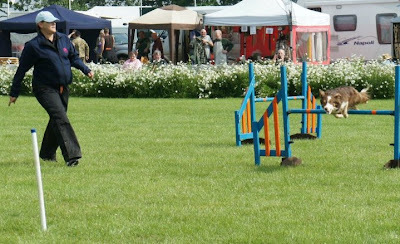 I ran an agility display at the Lincolnshire showground on 20th & 21th June. 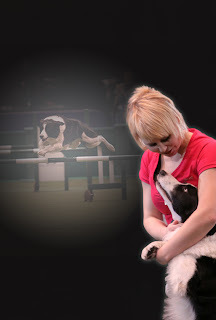 It was Agility Buds first Agricultural show display and it went Superb! Wednesdays was fantastic weather. All in T-Shirts and ¾’s and shorts, id Kinda forgot we got that type of weather in England. Typical that i forgot my camera on the weds! So only managed to get someone to take a few picts on the Thursday. The displays went great! I put up a nice flowing course and got the audience involved. I was pretty nervous about being the one in the ring on the microphone and getting the audience going but as soon as I was in there with the gang there was no stopping us! We got the audience cheering whist some of the dogs ran the course and the again at the end cheering for their favourite duo! 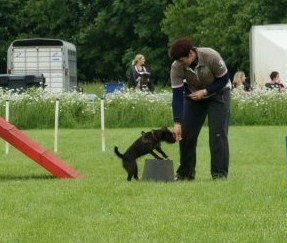 We then showed the audience some Fun Filled foundation games, it was the young dogs time to shine. This was a great opportunity for some of my student’s young dogs to get experience in an unfamiliar environment, and with their handlers probably feeling a bit nervous. The young dogs did fantastic and took everything in their stride! They didn’t even sniff at the pig poo from the racing pigs that were the display before us! A real boost of confidence for the handlers. Then on the last showing on both days we managed to squeeze in a relay which really hyped everything up including the audience. Very well done to the Agility Buds team students that managed to make it. I received an E-mail from the organisers saying they had some fantastic feedback about our displays and I’ve confirmed our 2 day slot again for 2013! Well done guys!